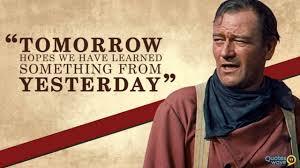 As a kid growing up I wanted to be John Wayne. I’d swagger around the house saying ‘howdy pardner’ and spend Saturday afternoons holed up in the beanbag watching John clean up a town by mercilessly dealing with the bad guys. I’m sure that all of you with ‘no good scoundrels’ in your team or workplace would love to follow Wayne’s example. A good ol’ saloon brawl would probably fix things. But unfortunately HR policies dictate a different approach. These days the key to successful culture change is to use your people wisely. Divide your team members into the following groups and concentrate your efforts where they’ll have the most effect. But unlike John, don’t fixate on the bad guys. Explorers: These are the people who will be eager to change; who are already looking for something better. You wont need to convince them to get on board as they will already be off and running. You may have to pull them back a tad; such will be their enthusiasm. Pioneers: These early adopters wont be as eager as the Explorers but will be quick to hitch up their wagon on the mere prospect of something better. They will be willing to do some dirty work and heavy lifting to set up the infrastructure that will entice the others to get on board. Settlers: Once the destination has proven to be safe and the groundwork has been done the Settlers will gradually jump on board. This group will make up the majority of your people. They aren’t opposed to change, but will need to be convinced that the new place or way of doing things is better than where they are now. Old timers: These are the ones who have been through all of this ‘culture change’ stuff before. They are jaded and sit there on the porch cussing at the fools who have decided to move to the new world. “You’ll be back’ they stubbornly cry, refusing to move from the safe and comfortable surrounds of what they know. Outlaws: these are the ones who will actively sabotage your move to a better place. Usually there work is done behind closed doors with a whisper here and a derogatory comment there. The modern term may be passive aggressive or hugely resistant to change. Another term may be ‘pain in the arse’. The trap many leaders fall into is spending 80% of their time on the 20% who don’t get it – the Old Timers and Outlaws. This is simply a waste of time. Spend 80% of your time on the 80% who get it (Explorers, Pioneers, Settlers). Your greatest weapon against the bad guys will be ‘weight of numbers’, so generate momentum by getting the easy ones on board first. Guess what will happen to the Old Timers and Outlaws? They will either hitch up their wagon and head along with you, or they will ride off into the sunset never to be seen again. If you want to learn more about building a team full of ‘happy Pilgrims’ contact Nathan Burke Consulting. For the month of November we are giving away two free High Performing Team Presentations. Just contact us and leave your details at Nathan Burke Consulting for your chance to win.